In writing this book Rosaleen has captured the heart of every man, woman, and child, seeing the world through the eyes of a Teddy Bear, and has stirred up childhood memories of long forgotten years. Whether you are a child or an adult this book has been written just for you. Teddy Bear is usually the one and only toy that Mum will trust with her baby, as he/or /she begins to learn how to place trust in what is usually her first soft toy. Such soft fur and a welcoming face is a joy to see giving young children confidence in the knowledge that when dad and mum turn out the lights at night their little one is not alone. Also Teddy plays a role when children have bee advised about their behaviour and they feel frustrated they can confide in Teddy. Teddy is on children`s level and even when one has to go shopping and leave at home their partner who may not be well it is a nice thing to place Teddy beside them on the sofa. 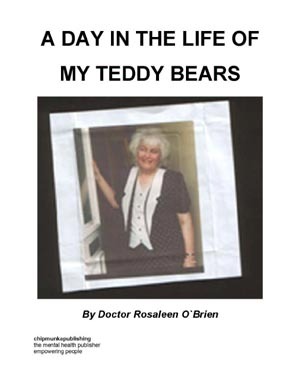 This book has been written by Rosaleen who got behind the mind of Teddy and has related his concerns and joys, even older folk in hospices have a Teddy to bring comfort. All in all this book deserves a place in every school, nursery, library, and of course family homes. Teddy Bear promises one thing that is he will give you back all the love that you give him and more...By the way Rosaleen has just one question...What happened to your Teddy Bear? I have been in receipt of trauma counselling since 1999 on a daily basis,at times speaking till the early hours of the morning.Support from my trauma Counsellor helps me to come to terms with accepting that what has happened to me cannot now be changed. I cannot ever forgive those who had a vicarious liability to look after me and failed. As a result of being locked away for some years all because we were poor has brought certain limitations to my day to day life. Writing is a form of therapy and allows me to be free to be the person that I want to be, and should have been my birthright. Through writing I can reach out to others who may have had such an unfortunate experience as myself . Daily flashbacks can be upsetting and I fill my life with things to do so as to block them out. Day to day life can be exhausting and coping mechanisms that I learnt in order to survive have not helped me in the outside world. God help all fellow survivors and perhaps one day Ireland will accept the terrible price we paid. Shame on all you right thinking residents in Ireland to allow the government and Catholic Church to ignore harm done to me and many others who are either dead or too ill to tell their story. Thanks to Chipmunkapublishing I have been able to confront my demons and a Big Thank you to Reatha my trauma counsellor without her I would not be here today writing about my stolen life.